Food Costs > How Much Does Spaghetti Squash Cost? How Much Does Spaghetti Squash Cost? Believed to have originated in the Americas, the spaghetti squash is a variety of winter squash that is oblong and has a slightly sweet and mild taste. Unlike other squash, when cooked, the flesh falls away from the fruit in ribbons or strands that resemble spaghetti, which is where the name comes from. These strands can then be baked and used as an alternative for pasta in many dishes. On average, plan on spending around $0.50 to $1.50 per pound. The average spaghetti squash will be less than $4 at your local grocery store. The cost will depend on where you live, the store you purchase it from and the time of year. On a forum thread on MyFitnessPal.com, most stated that you should plan on spending around $0.50 to $1.50 per pound depending on where you plan on purchasing it. Members on this DiabetesForums.com forum thread said you can find it for as little as $0.19 per pound if you buy it in the right area and it’s in season. Another member also stated that Trader Joe’s commonly has it for less than $2. At Wegmans Food Markets, at the time of this writing, they were selling spaghetti squash for $1.49 per pound. Amazon.com had a few listings, but the prices were much higher since it was shipped from overseas. The Happy Housewife says you should be able to find it for as little as $0.70 per pound, which when compared to spaghetti noodles, it can be cheaper. As a lower carb option, a cup of raw spaghetti squash has 200 calories, 40 grams of carbohydrates and two grams of fibers; however, when cooked, it has just 40 calories, 10 grams of carbohydrates and two grams of fiber. 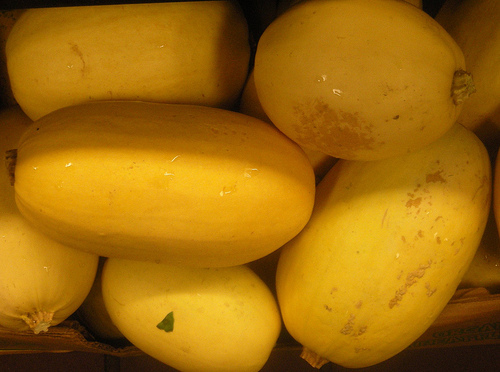 Spaghetti squash can come in a range of colors, ranging from an ivory to yellow to orange; the more orange in color the squash is, the higher the content of carotene. When cooking, it can take upwards of an hour to prepare. It is best to consider a recipe before you go to the store. This way, you get to have the right amount of squash that you need for cooking. The seeds that are found inside a spaghetti squash can be baked in the same way that pumpkin seeds are. These can make a delicious and healthy snack. Even though it resembles pasta-like spaghetti noodles, it really does not take like pasta. Instead, it is more like a vegetable. However, if cooked with the right blend of ingredients, it can be a tasty meal without sacrificing taste. To cut the squash, first lay it on its side and cut the stem off. While it’s still on its side, insert a knife into the top of the squash, rocking it down until it hits the cutting board. Rotate the squash and proceed to cut the other side, separating the squash into two halves. When choosing one, look for one that’s smooth in texture with a dry rind. There should be no soft spots or cracks. It’s also best to avoid one without a stem as the stem is responsible for keeping the bacteria out of the squash. The spaghetti squash is known as the “four season squash” and is readily available throughout the entire year; however, the peak season will be from the early fall to late winter. If you want to store fresh spaghetti squash, it can last for months as long as it’s kept in a cool location. This location should be out of the sunlight and at about 50 to 65 degrees Fahrenheit. Also, avoid the refrigerator as this will make it spoil faster than if it were outside of it. Consider a local farmers market as the prices are often cheaper and the taste is much fresher.